Condition is Used. The manual is available online. My action pictures are terrible but they show the red line at the top of the picture and that it doesn't affect Blu Ray or letterboxed DVDs. The scene where the red line shows is a TV show in the old TV format. Trending at $404.50eBay determines this price through a machine learned model of the product's sale prices within the last 90 days. Includes: Projector, manual, remote, batteries, power cord. Epson Home Cinema 760HD 3LCD 3300 Lumen Projector V11H848020. Condition is Used. Shipped with USPS Priority Mail. Pefect epson 760 hd about 7 months old cosmetically and functionally perfect as new shape. Only 875 hrs on original bulb bulbs last 10000 plus hrs and always run in eco mode. Moving must sell gorgeous hd picture awesome for tv viewing, gaming movies my personal pj. Is warrantied all paper work , remote included manuals. Excellent condition. Comes with original box and all cables. Bulb has only 11hrs on it. Pretty much brand new. The fcous uniformity is excellent, its nice and sharp evenly across the image. I uploaded several images to give you an idea of the picture quality. OK small issue, this has several faint orbs in the image that I can see on a very dark to solid dark images. Trending at $425.00eBay determines this price through a machine learned model of the product's sale prices within the last 90 days. Epson Home Cinema 3500 1080p 3D 3LCD Home Theater Projector. 1 and an astounding contrast ratio of up to 200,000:1. Brilliant image quality requires high color brightness. Contrast Ratio: 15,000:1; Keystone Correction: Yes; Lens Shift: No. Connectivity: 2 HDMI (1 MHL), 1 RCA (composite), 1 RCA (1 audio L/R), 1 VGA D-sub 15 pin (computer input/component), 1 USB Type A, 1 USB Type B. Aside from several small, very faint scratches, its in near mint condition. This has been used for a total of 1504 hours and works perfectly. The focus uniformity is excellent,its nice and sharp evenly across the image. With a contrast ratio up to 200,000:1,unprecedented in its class. 1, you get deep blacks and extraordinary detail, putting you right in the middle of the action. Enjoy brilliant quality and blockbuster performance. 1080p (1920 x 1080) native resolution. Weighs 5.95 lbs. for easy transport to a friend’s house for your next movie night. New in open box. Included remote. Provides crisp sound. Built-in speaker. Ensures quiet operation. Used in excellent condition. Fully Tested, Remote. Awesome picture. Experience extraordinary image quality and blockbuster performance with the bright Home Cinema 3500 projector, perfect for your living room or dedicated home theater. 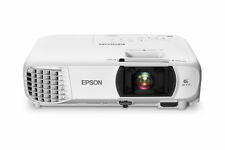 Offering up to 3x Brighter Colors* than competitive models, Epson 3LCD projectors ensure stunning images. Featuring 2500 lumens of color brightness and 2500 lumens of white brightness1 — plus up to 70,000:1 contrast ratio — the Home Cinema 3500 presents 2D and unbelievable 3D entertainment. Get Full HD 1080p with exquisite, enhanced detail. And, with wide vertical and horizontal lens shift and 1.6x zoom lens, positioning is easy and flexible. The projector also includes two built-in 10 W speakers for lifelike sound. The versatile and bright Full HD home theater projector for stunning images. Epson PowerLite Home Cinema 2000 Tri-LCD Projector. Condition is Used. Shipped with USPS Priority Mail. Amazing 3D picture quality. all of the pictures were taken on 4/9/2019. Also thes pictures were taken with the projector on a table if mounted on the ceiling the dust spot locations would be flipped. This is in near mint condition, just a few lite ,tiny scratches on top. This works perfectly as it should and really produces a nice image. The white field uniformity is off a little, which is normal. Trending at $339.49eBay determines this price through a machine learned model of the product's sale prices within the last 90 days. Fully Functional. Lamp hours 2075. Projector and generic power cord (as shown in the picture). We won`t be able to cancel order that already processed. FOR THE TRANSMITTER ONLY! NO PROJECTOR. This is for the transmitter only - NOT THE PROJECTOR. 4K Wireless Transmitter Model: WIT4-GO. 5 out of 5 stars - Epson Home Cinema 2045 LCD Projector white 3LCD 1080P Full HD 3D ready, sealed. 8 product ratings8 product ratings - Epson Home Cinema 2045 LCD Projector white 3LCD 1080P Full HD 3D ready, sealed. This is NOT Refurb/used/opened. Condition is New. 3LCD 3-chip technology. Get brilliant, color-rich performance that displays the entire sRGB color space, plus DCI in Digital Cinema Mode. HDR technology expands the contrast and color range of the pixels on your projector to reveal a better, brighter, more colorful image. This allows for a simple solution versus running longer HDMI cables through your walls. HDR PROCESSOR – Full 10-bit HDR (3) color processing accepting 100% of the HDR source information to faithfully reproduce HDR content for an exceptional visual performance. Experience incredible cinematic adventures with 2D and 3D, Full HD 1080p performance. Get deep black levels with a contrast ratio up to 600,000:1. Projector and power cord only. Contrast Ratio: 600,000:1; Keystone Correction: Yes; Lens Shift: Yes. Trending at $626.00eBay determines this price through a machine learned model of the product's sale prices within the last 90 days. Bought it from BestBuy and used for couple months. Decided to downgrade due to smaller house recently moved. Condition is perfect, lamp life is about 100 hours used, like new with all accessories, not even a scratches or dents ! 1 x Projector. Has New lamp with 0 Hours on it. (Except other vice stated or item is listed as broken or as-is). Looks good. Clean and quiet. Low hour OEM lamp. Lamp counter reset. All pictures you see are of the actual item that you will receive. Trending at $499.00eBay determines this price through a machine learned model of the product's sale prices within the last 90 days. There are scratches and marks on the surface. Must be in the exact conditions as when received. Box has been opened to insure it is in new and unused conditions. Device Type 3LCD projector - 1080p. Video Modes 480p, 720p, 1080i, 1080p, 480i, 576i, 576p. Lens Aperture F/2.3-3.6. Lens Shift Direction Horizontal, vertical. Vertical Lens Shift 96% / 96%. Horizontal Lens Shift 47% / 47%. 1080p (1920 x 1080) native resolution. Reproduces wide images in their correct proportions. Boost display visibility and produce clear, vibrant on-screen images. Allows everyone in the room to enjoy a clear view.